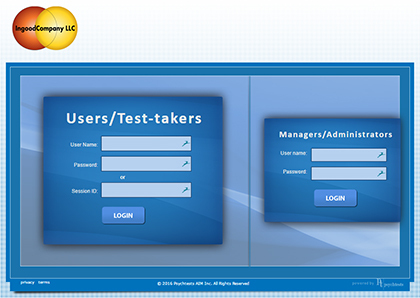 InclusiveWorks® operates an online assessment portal utilizing Plumeus/Arch Profile, pre-eminent worldwide providers of psychological assessment products and services to human resource personnel, therapists, academics, researchers and a host of other professionals around the world. A continually expanding battery of assessments and new features has been a hallmark of the service since its inception in 2002. The development and support for the assessment center is comprise of a dedicated team of psychologists, test developers, researchers, statisticians, writers, and artificial intelligence experts. The battery of profile tests are used around the world for a variety of purposes by recruiters, counselors, life coaches, consultants, sports coaches and athletic organizations, academic researchers, university professors and students. The test battery covers a variety of topics including personality, intelligence in its many forms, mental and workplace health issues, specific job aptitudes, career-related issues as well as attitudes, beliefs, and values. Our assessments use artificial intelligence methods to score and interpret the answers. They automatically produce a report with graphs and numerical results, summary and detailed narrative interpretation, complemented by an extensive advice and tips section. These reports can be enhanced with additional modules available in ARCH Profile, such as benchmarks, custom-tailored interview questions, or comparison reports for multiple users. All tests are rigorously developed and based on a thorough statistical analysis. Each test is well researched and designed according to the APA (American Psychological Association) standards for educational and psychological testing, measure up to APA standards for psychological and educational testing, and are developed with EEOC in mind to ensure that possible adverse impact is minimized. In addition, the research group routinely conducts statistical analyses to ensure that the assessments respect the EEOC standards. EEOC compliance data are reported in the test catalog for each assessment. For more information on testing using InclusiveWorks® online assessement center, CONTACT US with questions about your assessment needs. CONTACT US @InclusiveWorks for more information on access to these fast, accurate and reasonably priced instruments.